Making earrings can be addictive. I believe that once you start making your own jewelry, you will soon be asked to make earrings for friends and family members. It's likely that strangers and acquaintances might even ask to buy your handmade earrings. These can be quick and simple projects which you can finish in 10 minutes or more intricate earring designs that will take longer to complete. But every pair of earrings should be comfortable to wear and follow some basic rules. So I thought it's necessary to write this page. Here I will put down some basic rules for making earrings. These are rules that would be helpful to know before you sit down and construct a pair of earrings whether for yourself, or for a friend or customer. 1. Ear hooks: The piece that is attached to your ears. This could be a pair of ear hooks, ear studs, or ear posts. This piece will have a loop that enable you to attach a jump ring or chain. The wires that go through the holes of the pierced ears should not be too thick. For ear studs, the wires should also not be too long so that they do not touch the flesh behind the ears. 2. The jump ring or chain: This is important in the construction of a good comfortable pair of earrings especially a pair of dangling ones. With a chain, a jump ring is not necessary unless the chain is too tiny to go onto the loop on the ear piece. Then a jump ring that is slightly larger than the chain will be necessary to make the attachment. Note: This part is not necessary if both the loops of your ear hook and the dangle or drop are big enough to enable easy movement for the dangle or drop. 3. The dangle or the drop: This is usually the decorative part of the earrings. The dangle or the drop should not be longer than an inch. If you want to add more beads and length to the earrings, you might like to make beaded links and attach them to form a longer drop. This will ensure that the pair of earrings hang loosely on your ear-lobes. If too many beads are added onto a eye pin or head pin, the tendency for the earrings to stick out is very likely. The Weight of the Earrings: When creating earrings, the weight of the earrings is also very important. Whether you are using glass beads or gemstones, make sure that each earring does not weigh heavily on the ear-lobe. Too heavy and the earring can tear the ear hole. I have seem ladies with their ear lobes torn by wearing too heavy earrings. This can be quite unsightly and might need to go through a minor surgery to stitch up the slit. The Shape of the Earrings: It is important to take into account the shape of the wearer's face and hairstyle when making earrings. If the person wearing the pair of earrings has a round face, then the earrings design should not be round or square but rather longish or triangles. This will enhance her face and make her look thinner instead of emphasising the roundness of her face. This is equally important for a person with a longish face. A pair of earrings that is so tiny will look rather lost for one who has large bone structure. The Color of the Earrings: Making earrings for someone with a yellowish tint in her skin complexion using pale yellowish citrine gemstones are not likely to bring color to her face but rather make her look pale and sickly. If pale colored stones or beads are used (maybe it's the color of her birthstone), try adding some more stronger colors that can enhance her face and make her look lovely instead of sickly. Another example, if making earrings for a medium dark complexion person, using orange colored beads or stones might not be suitable but if these are made for one with very dark skin tone, then the same orange color might be just beautiful on her. So it is best to test the beads or stones by placing them against the skin of the person you are making for to see whether the colors will suit her skin tone. 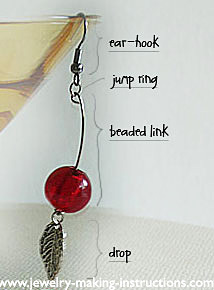 The above are some of the basic guidelines that I find helpful to making earrings. Hope these guidelines are useful to you too.